How to Handle Pedestrians Who Aren't in the Crosswalk | Phoenix Personal Injury Law Blog - Breyer Law Offices, P.C. Everywhere you go you likely see pedestrians who cross the street without using a crosswalk or an intersection. This can be frustrating for drivers, especially when you don’t know how to handle the situation. Arizona law is set out to help pedestrians understand their responsibilities when it comes to crossing the street. According to ARS 28-793, pedestrians must always yield to traffic if they are crossing the street in an unmarked crosswalk or at any other place on the road. The only exception to these rules are when pedestrian signals allow crossing at an intersection or when there is a marked crossed walk, in which case, motorists must yield to pedestrians. The law further prohibits pedestrians from crossing in the middle of the road when there are intersections nearby that could provide safe crossing. Drivers must always practice due caution because purposely striking a pedestrian, whether in violation of the law or not, carries heavy penalties. Every year, more than 1,500 Arizona pedestrian collisions are reported by the Arizona Department of Transportation (ADOT). Nearly 80 percent of these accidents result in injuries to more than 1,250 involved individuals. Around 155 pedestrians die as a result of the injuries they sustain in these collisions. 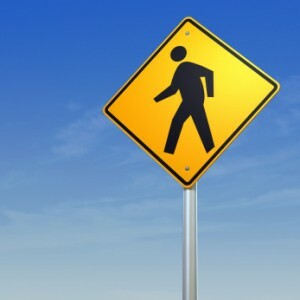 Pedestrian collisions are simple to avoid if both those walking and those driving stay alert. The best way for drivers to avoid being involved in a collision with a pedestrian is to slow down at intersections, crosswalks and other places where pedestrians are approaching the road and watch them cautiously for sudden movements. When you’re the victim of an Arizona pedestrian collision you may not know who to turn to, but you should call a skilled personal injury attorney. The attorneys at the Breyer Law Offices, P.C. assist injured pedestrians in getting a fair settlement for their pain and suffering. We help to secure compensation from the at-fault driver that covers medical recovery, financial losses, and personal trauma. For a free consultation on your pedestrian accident injury case, contact attorneys Mark and Alexis Breyer now.